On this National Women’s Entrepreneurship Day, I hereby declare a counter-movement: one rooted in women who hold themselves in such a manner that any mere man would cower at the thought of treating her as a sexual object. No, I am not blaming the victims of the numerous accounts now coming to light. Yes, I am calling for women to claim their dignity. Yes, I am “privileged”: Both of my grandmothers earned their way while operating in the man’s world of the early- and mid-20th century—one had been a flapper who helped see her family through the Depression on her self-employed earnings, the other was a product of the prairie and early childhood among American Indians, whose culture she admired throughout her life. Thrust into leadership of the business empire my grandfather had founded upon his accidental death when she was 65, she ably managed the existential crisis created by his death, continuing to oversee the businesses’ growing success over the next three decades. My mother was similarly a strong role model, equally at home on corporate and non-profit boards as hands-on Camping Chair of my Girl Scout troop, and the founder at age 60 of a now top-ranked K-12 independent school. 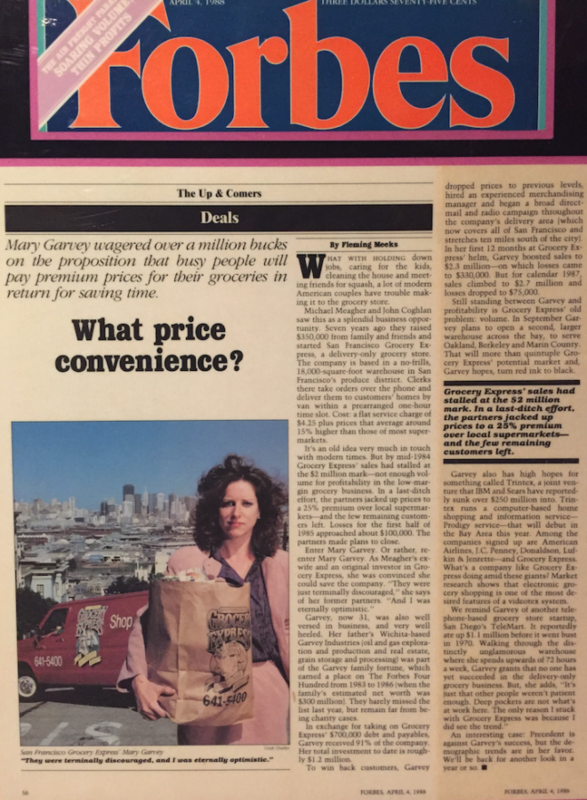 I was a young woman entrepreneur in the 1980s in the (surprisingly to me) very male chauvinistic grocery industry, with the added twist of being at the forefront of the new “teleshopping” industry, as President of the all-delivery San Francisco Grocery Express. Started in 1981, and based in a warehouse in San Francisco’s produce district, we offered the revolutionary service of home-delivered groceries ordered by phone. In 1984, we pioneered computer shopping: you could dial into our computer from yours over your 300 baud modem and order your groceries for delivery. I worked with IBM and Sears in the development of their Prodigy online service, through which Grocery Express was available on its roll-out in 1988. As a 1980s version of a “hipster” capitalist, I was treated as a “media darling”: featured in magazine and TV stories in an era when entrepreneurship was “hot:” “In Search of Excellence” was a top-rated TV show; books about entrepreneurs topped the bestseller lists. And as a young, attractive woman, I made a good story, feeding the current interest. I was very surprised to learn how very male, and how very old school, the mainline grocery industry was. Attending the National Grocers Association convention in Chicago felt more like being with meat packers than my peers, and as my publicity grew, and offers to buy me out rolled in, I found myself confronted with many men who tried to discount me as just a pretty face. Yet I have never been sexually harassed or the subject of an inappropriate approach. And I have to ask myself why. Was it channeling my Quaker grandmother’s formidable demeanor—one cannot imagine anyone crossing it with a suggestion of impropriety. But, no, I don’t think I really mastered that. I think it was more what my father taught me. He was a typical successful businessman of the “Mad Men” era, at the height of his success and dynamism in the 1950s and ‘60s (as chronicled in his biography, Willard Garvey: An Epic Life). And he witnessed first-hand behaviors such as that depicted in the popular TV series: predatory men, taking advantage of the loosened mores and availability of attractive women around them, whether in the workplace or social sphere. Yet Dad had a very strong moral code that he voiced regularly in imparting lessons to his children, whom he was also grooming in his business: one who cheats on one’s personal relationships will cheat in business. Temptations are everywhere, and the only protection is to hold oneself in check: project the persona by which you want to be regarded. If you’re on the make, others will pick up on it. If you’re not, be strong in making sure it’s clear you aren’t. And I think it is this our culture has lost. We have become seduced by the corrupt culture of politics and celebrity, where all are by definition on the make. It is time to recapture and re-embrace a culture of individual enterprise, which is by definition dependent on reputation of unfailing integrity. Today’s Millennials express an extreme distrust of politicians, and admiration of “hipster” capitalists, and well they ought—and well we ought encourage this. In the private sector, virtue—playing fair, achieving success through satisfying one’s customers—is rewarded. Lying, cheating, stealing, or being a sexual predator is a quick road to universal refusal to do business with you. So let us on this National Women’s Entrepreneurship Day celebrate the realm of enterprise as the ultimate women’s liberator, and warn our sisters from playing in the corrupt and exploitative sandboxes of popular culture and politics.